Size: M, Color: White/Medium Grey (Assorted) is currently out of stock! Size: XL, Color: White/Medium Grey (Assorted) is currently out of stock! 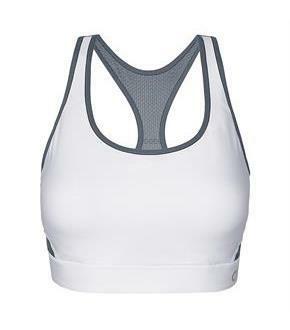 A Workout WinYou don't have to choose with The Great Divide, support and shaping come together for a natural-looking, flattering fit.Contoured under-bust inner channel and molded cups shape and provide Moderate Support.Compressive fit for support.Racerback with keyhole design for total ease of movement.Moisture wicking technology keeps you cool and dry.Wide, soft bottom band for next to skin softness.Powermesh panels allow max ventilation in top hot zones.Perforated wirefree cups for cooling airflow.Reflective C logo on band, patch C logo at center back. Pullover, no hardware design.